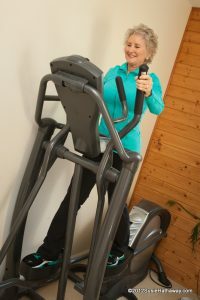 Whether you’re using the fitness center in a motel or joining a gym this summer, here are tips on how to stay safe on fitness machines with osteoporosis or if you’re over fifty. 1. Check the Machine Out Before Getting On! I recently returned from California to celebrate my daughter’s college graduation. (Yay!) Our motel had a fitness center that I checked out our first morning. I picked a treadmill that looked pretty sturdy and set the program to what I thought was a 12-minute mile pace, just to test the speed before I stepped on. Well, the belt took off as if it was set to 120 mph! I was amazed and horrified at the same time and carefully punched the stop button. Luckily, I’m in the habit of starting with my feet on the sides or I would have been catapulted off the thing in no time flat! Since many of you will be traveling this summer, you might find yourself in the same situation. Or, you might live in an area that is too hot to exercise outside and you’re looking for a fitness center to join. Of course, seeing your healthcare provider and a getting referral to a physical therapist (PT) is always advised before jumping into a fitness program with unfamiliar equipment. Learning the basics of safe exercise with bone loss from a PT would help you be able to advocate for yourself in a new fitness center. If you’ve had a fracture, many fitness machines could be contraindicated. If you’re joining a gym, I’d suggest doing some shopping for one that provides a well-qualified trainer who could advise you on the use of their machines. If you have bone loss, emphasize that you need to avoid forward bending, twists to the point of strain, deep side bends, plus quick uncontrolled moves or high impact. Make sure that you’re keeping an elongated spine throughout your workout. If you’re going to be using a fitness center in a motel, get educated about exercise machines before leaving home! None of the machines should put any dangerous downward pressure on your spine, such as a heel lift machine. It has pads that come down on the shoulders, adding resistance for the calf and ankle muscles when you rise up on your toes, but it puts downward pressure on the spine. Other machines that can put downward pressure on the spine are a leg press machine where you’re in an inverted position (head down). A squat machine (or holding a barbell) puts downward pressure on the shoulders and spine. Twisting to an end range of movement, especially in combination with a forward bend, with a pulley machine is great for the core, but risky for a person’s spine who has bone loss. 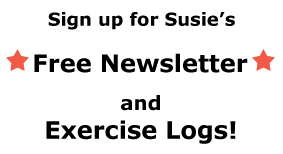 The “wood-chop” type of exercise with a pulley is an example of one to avoid. Those are just some examples and each individual fitness machine would need to be evaluated to make sure that you don’t have downward pressure on the spine or rounding forward or twisting of your spine. Also, I’m not fond of the back machines in which you push against it with your back. As you can see, machines can be quite risky. 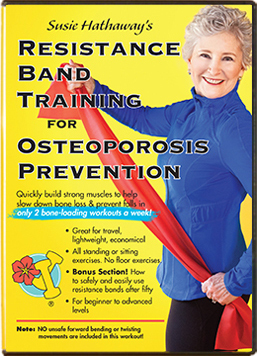 There are many good back strengthening exercises you can do without a machine, like the back extensions we do in my Safe Strength Training and Resistance Band Training for Osteoporosis Prevention DVDs. Your safety would also depend on the how much weight you’re lifting—(ask your doctor or PT what your limit might be), your posture and strength, the way you move when you lift, and if you’re able to keep an elongated spine throughout an exercise. As far as the cardio machines, ask the trainer at your fitness center how to safely start and walk on their treadmills. The machines should be able to start very slowly. Use the safety clip on a string that stops the treadmill if you trip or get too far out toward the end of the platform. Starting with your feet off the treadmill and on the edges, then stepping on when you’re sure that it’s going at a slow speed, is a good precaution to take. With elliptical and stationary bikes, take care to keep upright posture and don’t let the arms pull you into a rounded back position. Margaret Martin, PT, has some very helpful YouTube video clips. Here’s one on rowing with osteoporosis with suggestions on how to keep it safer. 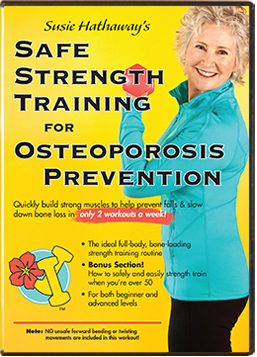 The “8 Osteoporosis Exercises for the Gym” clip has excellent tips. Go easy while you’re learning your new form. I hope these tips help keep you safe this summer! But remember, that it’s best to get comprehensive, one-on-one instruction from a physical therapist to get you off to a good start with your fitness program. Then, a well-qualified personal trainer could help you develop a safe exercise program with appropriate fitness machines. 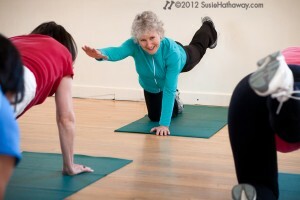 I love Susie’s workout and am so grateful for the greater strength it’s given me. I’m 65 and the last time I biked, my mind was blown at the hills I could go up at almost full speed that had had me up and pumping or even walking my bike in years past. I feel like every part of my body has been strengthened in a balanced way, and I have much greater stamina, too. Thank you, Susie, for not just increasing bone strength, but every kind of strength! Congratulations to Gabrielle–and to you and Steve as well! I found the hints on using the weight machines to be wonderful. Thanks for sharing them. Great! Glad to help, Janet! I recently had a bad fib/tib fracture from what was an innocent fall. The break was far more severe than the fall would warrant. It may be that I have osteoporosis. So now I am 7 weeks without any weight on the injured leg and am desperate to find some exercises to get not only the injured let moving again, but the entire body from feeling so unbalanced. Do you have any modifications for these exercises that don’t involve standing on two legs? Sorry about your fracture, L.J.! The best action you could take is when you begin your rehabilitation with a physical therapist (which will be ordered soon, by your doctor), ask the PT what exercises you can safely do with your fracture. Show her the exercises you’d like to do and see if he or she has adaptations for you. You need individual one-on-one instruction. Any standing arm exercises can be done in a chair. I’m sure that you’ll be given leg exercises to strengthen your legs. Ask the PT about core exercises that can safely be done without bothering your leg. I’m sorry not to be able to give you suggestions, but it wouldn’t be appropriate with your fracture. A PT can give you individualized guidance and a good strengthening/rehab program.